Updated Friday March 15, 2019 by Jeff Knoll. 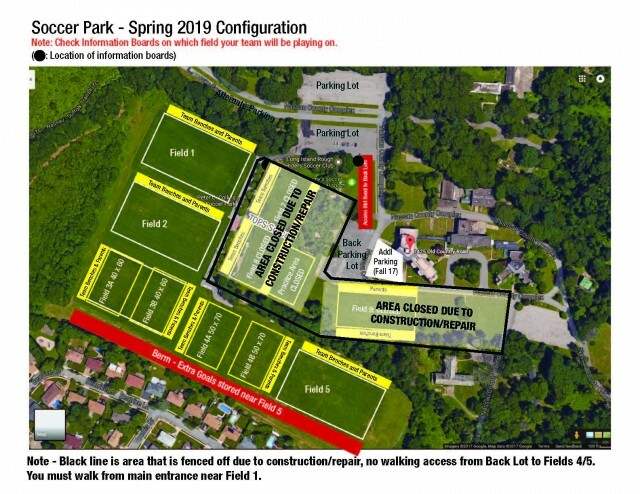 Here is the layout for Soccer Park for Spring 2019 season. Saturday, April 13 4-6 p.m.
Sunday, May 19 4-6 p.m.
Saturday, June 8 4-6 p.m.
LIJ PDP program trains Mondays 5:00-8:00pm, Fields 1, 2 & 3. Red Bulls program trains Tuesdays 5:00-8:00pm, Fields 3 & TBD. ALL UNSCHEDULED/MAKEUP GAMES MUST REVIEW THE ATTACHED SCHEDULE FOR AVAILABILITY BEFORE SUBMITTING DATES. NOT ALL SMALL SIDED FIELDS WILL BE AVAILABLE EACH WEEKEND. PARKING AVAILABILITY WILL ALSO BE LIMITED ESPECIALLY FESTIVAL WEEKENDS.